Have you had a chance to visit the new Wendy’s on South Main since their recent rebuild? Well, here is your chance to support local business AND HopeNow Furniture Bank at the same time. 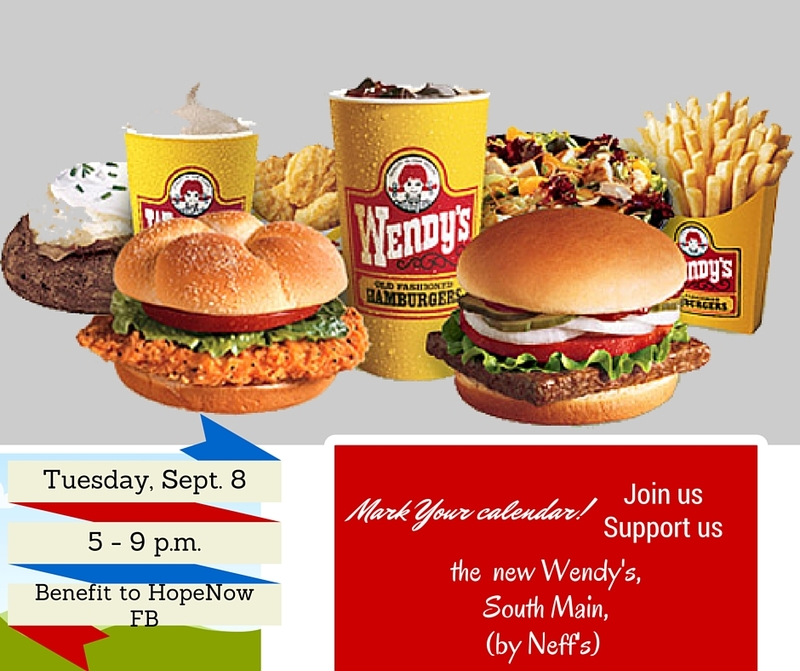 On Tuesday, September 8, Wendy’s on South Main in Mount Vernon will donate a percentage of all sales between the hours of 5-9pm to the work of HopeNow Furniture Bank. Mark your calendar, gather your friends and family, and join us on this evening to make a difference for the people of Knox County. Dan Emmett Days Festival is happening August 13-16 in Mount Vernon. 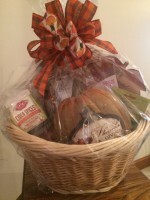 www.danemmettfestival.org There will be lots of excitement, activities and opportunities taking place to interest all. Hope Now Furniture Bank is anxious to participate because we see this as a wonderful chance to meet more of our Knox County neighbors and let you know about our mission and purpose here among you. 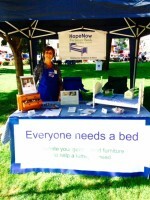 We will be setting up our display tent on Thursday, Aug. 13, on South Main Street. 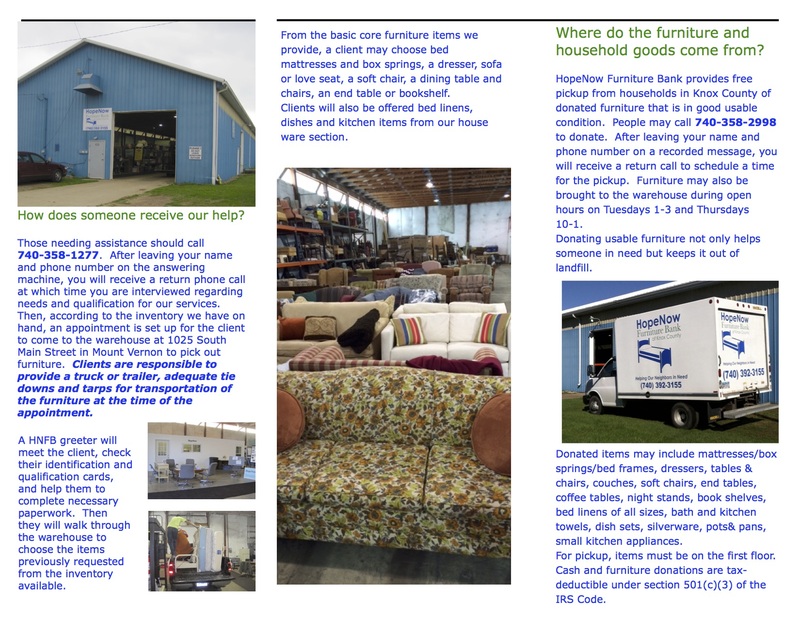 We will have a brand new brochure available which describes our work, along with our rack cards, business cards and other literature and promotional materials. Volunteers will be on hand to answer your questions. We are also very excited to announce that we will have 3 fantastic donated gift packages that you may be able to take home with you for a small donation to our work! We will have tickets – $1 for 1 or 6 for $5 donations. You will write your name and phone number on the ticket and at the end of the festival, we will draw a name for each basket. 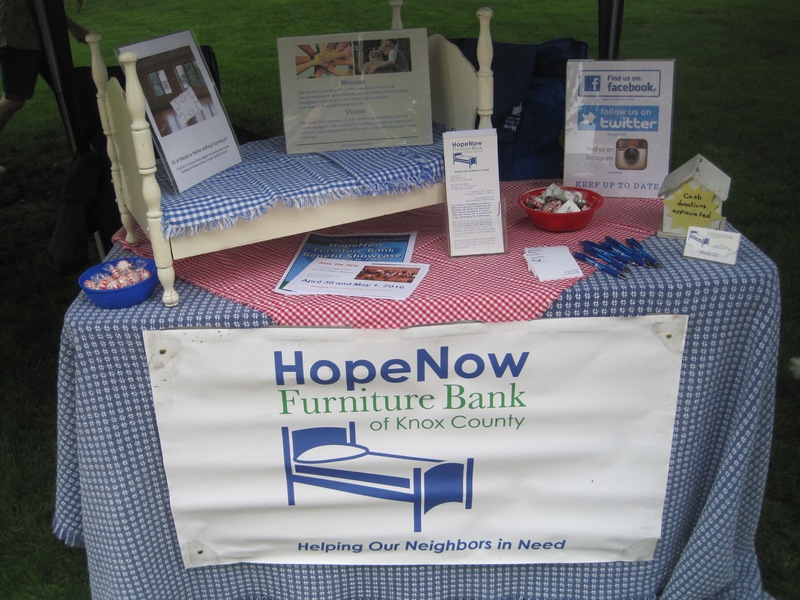 What a fun and easy way to participate in the Dan Emmett Festival, donate to a very worthy cause, and help someone in Knox County who really needs our help. The $100 value Fall basket was sponsored by Pat Catans. 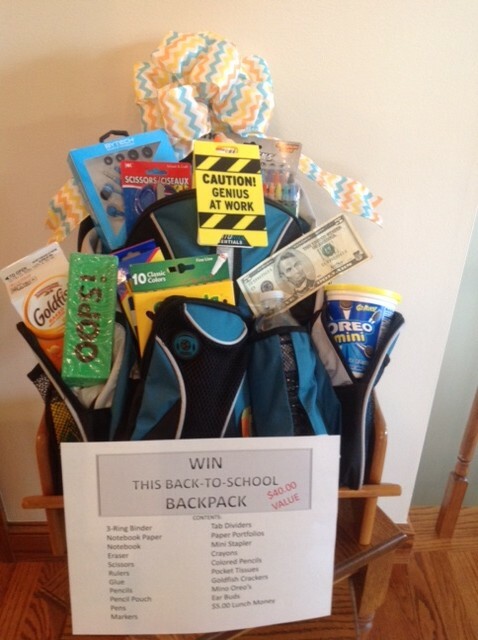 The $40 value school backpack and $60 Italian dinner basket were donated by Jack and Sherri Kockentiet. You will certainly want to look at them and make your donations! 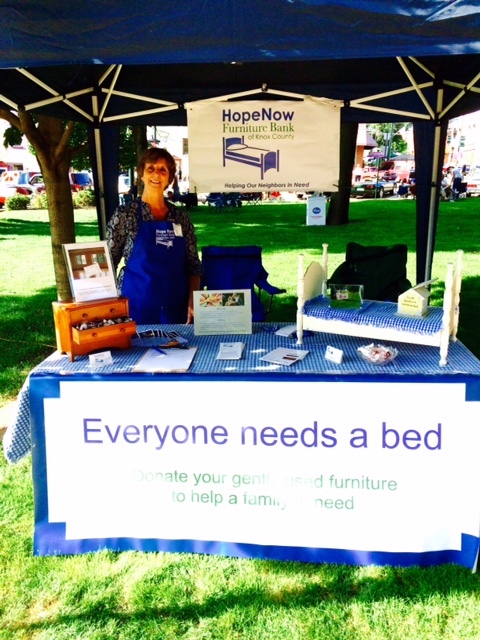 Come to the Dan Emmett Festival and look for HopeNow Furniture Bank. Downton Mount Vernon will be alive with activity during Dan Emmett Days, Aug. 13-16. 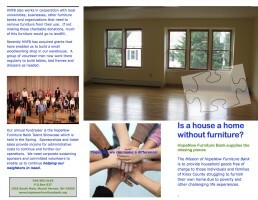 HopeNow Furniture Bank volunteers will be present and anxious to meet new friends. We will have some “give aways” and maybe a surprise or two. Be sure to look for our blue tent and introduce yourself. We’d love to share some information, pictures, and literature with you. See you there! 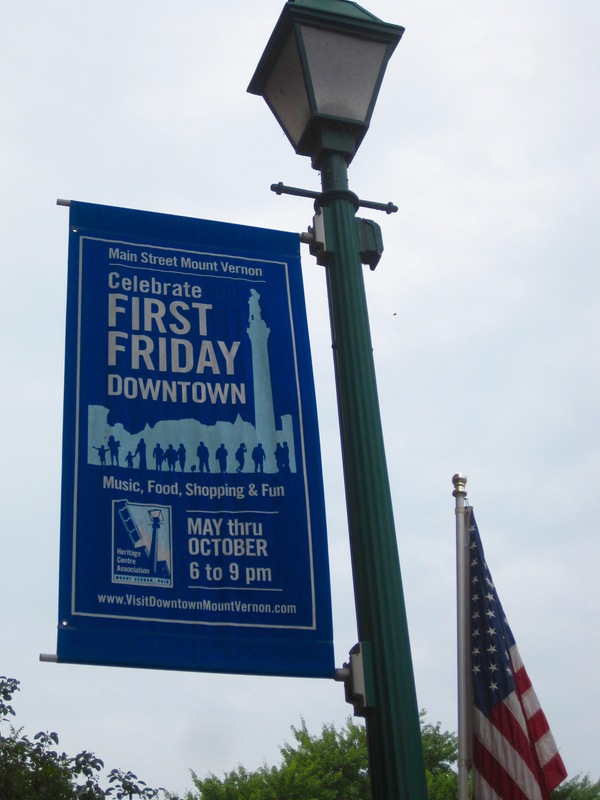 Meet us on the square in downtown Mount Vernon for First Fridays. 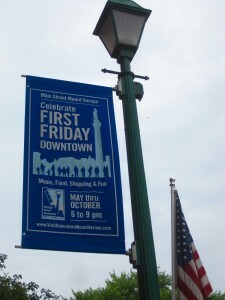 We’ll be there to greet you Friday, August 7, September 4, and October 2. Come down and ask your questions, pick up some literature, and meet our volunteers.